If you were successful in having Sapphire erase the debt, return to Shadr who is grateful and gives you a leveled potion of invisibility. 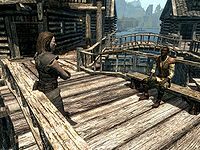 This will also increase Shadr's disposition towards you, meaning that you may be able to take items from the Riften Stables, including borrowing a horse. If you take Sapphire's offer, whether as a Thieves Guild member or the guildmaster, your cut will be a leveled amount of gold. This page was last modified on 14 March 2017, at 03:13.